Supermassiveblack holes spin at speeds approaching the speed of light, new researchsuggests. Nine hugegalaxies were found to contain furiously whirling black holes that pump outenergetic jets of gas into the surrounding environment, according to a studyusing data from NASA's Chandra X-ray Observatory. "Wethink these monster black holes are spinning close to the limit set byEinstein?s theory of relativity, which means that they can drag material aroundthem at close to the speed of light," said Rodrigo Nemmen, the study's leadauthor and a visiting graduate student at Penn State University. Einstein'stheory suggests spinningblack holes would make space itself rotate. The overall effect makes gasspiral in toward the black hole, and also creates a magnetic field that shootsinflowing gas back out as a jet. Researcherspreviously found that the greater the amount of gas falling into supermassiveblack holes — known as the accretion rate — the greater the energy of the jetsshooting out. Leading theories suggest that the same jets drive the rotation ofthe central black holes in galaxies. 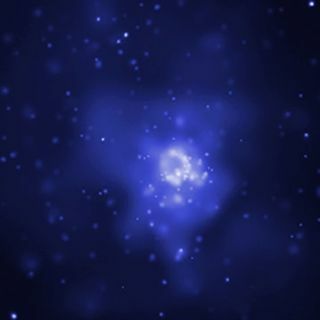 "Bycomparing observations of massive elliptical galaxies with current theories ofjet formation, we are able to get the spin of supermassive black holes,"Nemmen told SPACE.com, explaining how his group ran computer simulationsand compared the results with Chandra's observations of the nine objects. Black holescan't be seen, but their existence and mass are inferred by their gravitationaleffects on material around them and by the energy released from all theactivity. Theobserved jet power and accretion rates were huge — one black hole ate 10 Earthmasses per month and, from its surroundings, spat out 50 times the annualenergy of our sun per second. That allowed Nemmen and his colleagues toestimate that the spin of the black holes approaches Einstein's speed-of-lightlimit. "Extremelyfast spin might be very common for large black holes," saidco-investigator Richard Bower of Durham University. "This might help usexplain the source of these incredible jets that we see stretching for enormousdistances across space." The jetsproduced by such high-speed spins heat the surrounding gaseous atmosphere andcan help trigger the birth of stars. However, such powerful jets could also destroythe atmospheres of neighboring planets. The newresearch was detailed in a paper presented at a meeting of the AmericanAstronomical Society in Austin, Texas, last week.